Lisa has been involved with Reach in a variety of ways over the last 15 years. She began as a client, then a volunteer, an associate and eventually, as result of her passion and heartfelt commitment, she was invited to become one of the 12 partners. Lisa is a very experienced and skilled psychotherapist and she has the accolade of being one of only four individuals who excelled to such an extent in our postgraduate diploma that she acquired an impressive 10 distinctions. She is very warm, compassionate and highly intelligent. Her understanding and application of The Reach Approach makes her a very effective therapist, supervisor and tutor. She is experienced in working with individuals, couples and groups. 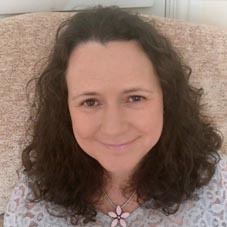 Lisa is someone who has had to face many demons of her own and we are confident that those who are looking for an ally on their therapeutic journey will not be disappointed if they choose her to walk alongside them… she is a very safe pair of hands. It’s hard to put into words just how happy I am to play my part in the wonderful work that Reach is doing across the world. I first came into contact with Reach as a client many years ago. I was going through very acrimonious divorce proceedings whilst undergoing treatment for cancer and doing my best to be a single mum to two very young children. My life was on a freefalling downward spiral, I was depressed and disheartened, unable to see any way forward. The most important thing that Reach offered me was hope. To somebody who is so lost, a sense of hope is the most precious gift in the world and it set me on the path to a whole new life that I could never have dreamed possible. My experience instilled a desire in me to take all that I had learnt and to use it to help make a difference to others who may be struggling. I went on to qualify as a counsellor/psychotherapist and have had the privilege of training in and working with the Reach model over the last 15 years. I am a BACP accredited practitioner and have experience working with a wide range of people and issues. Although during this time I have also become qualified in hypnotherapy, NLP and EFT, my proudest achievement has got to be completing Reach’s Postgraduate Certificate and Diploma in Holistic and Integrative Therapy. I know from experience, both personal and professional, that whatever your situation may be, there is always a better way. There is always hope. We can all lose sight of this for a variety of reasons, and it can make all the difference to have somebody to walk alongside us, map in hand, setting us on the path to a brighter and happier future. This is the gift that Reach gave to me and it is a gift that I love to share. If you feel that I can be of any help, you are more than welcome to get in touch on: 07989 398 405.